WALLACE, Henry Agard, a Vice President of the United States; born on a farm near Orient, Adair County, Iowa, October 7, 1888; attended the public schools; graduated from Iowa State College at Ames in 1910; served on the editorial staff of Wallaces Farmer, Des Moines, Iowa, 1910-1924 and was editor 1924-1929; experimented with breeding high-yielding strains of corn 1913-1933; in 1915 devised the first corn-hog ratio charts indicating probable course of markets; author of many publications on agriculture; appointed Secretary of Agriculture in the Cabinet of President Franklin D. Roosevelt in 1933 and served until September 1940, when he resigned, having been nominated for Vice President; elected in November 1940 as Vice President of the United States on the Democratic ticket with President Franklin D. Roosevelt and was inaugurated January 20, 1941, for the term ending January 20, 1945; unsuccessful candidate for renomination in 1944; appointed Secretary of Commerce and served from March 1945 to September 1946; unsuccessful Progressive candidate for election as President of the United States in 1948; resumed his farming interests; was a resident of South Salem, N.Y.; died in Danbury, Conn., November 18, 1965; remains were cremated at Grace Cemetery in Bridgeport, Conn., and the ashes interred in Glendale Cemetery, Des Moines, Iowa. Wallace, Henry A. The Price of Vision: The Diary of Henry A. Wallace, 1942-1946. John Morton Blum, ed. Boston: Houghton Mifflin, 1973; Culver, John C., and John Hyde. 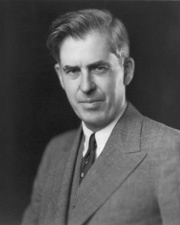 American Dreamer: The Life and Times of Henry A. Wallace. New York: Norton, 2000.